If you can’t stomach the thought of giving up spaghetti, macaroni, and lasagna, you might think a low-carb diet is out of the question. With a little creativity, you can satisfy your pasta cravings without adding carbs. Here are some easy, nutritious, and tasty pasta alternatives to try. While there are certainly pasta lovers who would be happy with a bowl of plain noodles, for many people it’s really the sauces and toppings that make a pasta dish—the noodles act as a vehicle for other flavors. If you’re following a low-carb diet, there’s a wide variety of pasta alternatives to choose from. Just like various pasta noodles have different textures and qualities, you can find a substitute that works best for the dish you’re creating, the tastes you want to feature, and the overall pasta-eating experience you're trying to match. With the right tools, a little creativity, and a lot of fresh vegetables, you’ll have plenty of low-carb options to choose from as you recreate your favorite pasta dishes. Not only do vegetables add more nutrition to a meal than traditional pasta, most of them are simple in taste and easily become a blank canvas for sauces and spices. While some veggies need to be coaxed into a pasta-like state, others cook up nicely with little to no extra prep and make excellent beds for complex flavors. Spaghetti squash naturally separates into spaghetti-like strands after cooking. With less than a quarter of the calories of regular spaghetti and just 10g of carbs per cup, it also surpasses pasta in nutritional value. Squash works well as a pasta stand in for casseroles dishes like turkey tetrazzini. Prep and cook time for spaghetti squash is pretty easy—you can even make it in a slow cooker. Zucchini, summer squash, and cucumbers can be shredded, julienned, or cut into ribbons with a peeler. 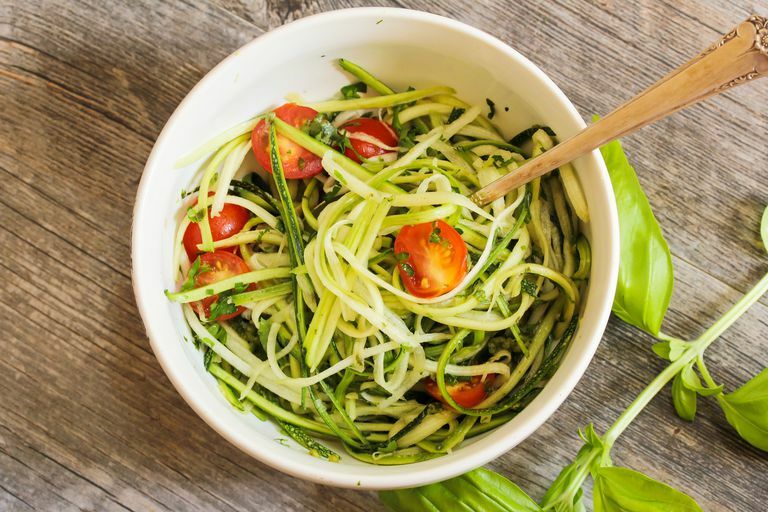 See more on spiralizing these veggies below! Use as a base for hot or cold pasta dishes. Cauliflower can be grated, finely chopped, or processed in a food processor. With about 5g of carb per cup, cauliflower is one of the more versatile pasta alternatives—to steam in the microwave, sauté, or roast. Cauliflower can be served as a substitute for rice or couscous as a side or as part of a dish. If you keep the pieces a little larger, cauliflower makes a great base for low-carb mac and cheese. Cabbage can be shredded and sautéed on its own or with sliced onion for more flavor. Cabbage has about 5g of carbs per cup, cooks up quickly, and can be easily cut into different thicknesses depending on the type of pasta noodle you're replacing. While you can also use thin-sliced carrots, onions, radishes, and beets on their own, adding them to your cabbage to creates a colorful coleslaw-pasta hybrid that can be eaten on its own or used for stuffed-pasta dishes. Bean sprouts have noodle-like qualities as they are, but you can also lightly sauté them before using as a base for a pasta dish. Sprouts are a staple of many Asian noodle dishes, and with about 4.5g of carbs per cup, they're a natural choice for low-carb Pad Thai. Even if they don’t quite have the noodle look, many vegetables have flavors that work well with classic pasta sauces. With 4.8g per cup, eggplant is one example. Try pairing eggplant strips with marinara. Given its texture and size, it also makes an excellent replacement for lasagna noodles. With a naturally long, lean, look and about 10g of carbs per cup, green beans can be dressed up with pesto for a tasty and colorful meal. You can also take traditional green bean pasta salad or casserole recipes and simply add in more green beans instead of noodles. With just 4g of carbs, this pasta, made from hearts of palm, is a plant-based pasta substitute you may not have heard about before. Palmini is low in calories, high in fiber, gluten free, and looks more like traditional pasta than some other alternatives. It can be purchased canned or in pouches. While you can eat it straight from the package, it also cooks up well—keeping its pasta-like consistency. For vegetables that need a little more preparation to play the role of pasta, there’s one gadget you’ll want to invest in. A veggie spiralizer or spiral slicer is a simple kitchen tool you can use to transform just about any vegetable into noodles. If you don’t have a spiral veggie slicer, you can use a regular vegetable peeler (the kind you’d use to peel carrots or potatoes). For the best results and easiest spiralizing, invest in one of the handy kitchen gadgets. Each tool will come with instructions, but the basic action is feeding the zucchini into one end and twisting the tool to grate it into long, thin, noodle-like slices. If you’re using a standard veggie peeler, peel the zucchini into super-thin strips, rotating the zucchini after each strip. Whichever method you use, you may end up with very long strands, so don’t even afraid to chop them a little shorter before cooking. Marinara: Look for a marinara sauce that's low in fat and has 60 calories or less per 1/2-cup serving. Sprinkle with grated Parmesan and top with a protein source like lean meatballs. Lemon-Butter: Add a squirt of lemon juice, some chopped garlic, and a little salt to a bowl. Toss with light butter and sprinkle with chopped basil. For protein, shrimp pairs well with these flavors. Pesto: In a small blender or food processor, combine 1/2 cup light ricotta cheese, 1 tbsp. grated Parm, 1/4 oz. (about 2 tbsp.) pine nuts, 1/4 cup chopped basil, 1 1/2 tsp. chopped garlic, and 1/4 tsp. each salt and pepper. Add 3 tablespoons water, and blend until uniform. This recipe will yield enough pesto for two servings of zucchini noodles. Veggies might seem like the obvious savory choice for pasta dishes, but you can also use your spiralizer to make noodles from apples and pears. Spiralizing fruit is more or less than same as veggies, just make sure you remove any seeds and stems before you get started so you don’t have to pick them out later. While apples can be high in carbohydrates, they’re still a lower-carb option compared to traditional pasta. 100g of cooked spaghetti has about 30g of carbs. One medium-sized apple (about 100g) has 14g, as well as fewer calories. Asian pears are firm and can withstand the spiralizing necessary for noodle-making. They also have between 10-15 grams of carbohydrate per serving. If you want to recreate your favorite Asian noodle dishes there are a few low-carb options that are tasty, easy to cook with, and affordable. Shirataki noodles: These plant-based noodles are also called yam noodles or konnyaku. Since the noodles are almost entirely fiber, they add hardly any calories or carbs to your meal. Shirataki noodles come packaged in liquid and are ready to eat—all you need to do is give them a quick rinse. If you don’t want to eat them cold, you can easily heat them up, but they don’t require cooking. Kelp noodles: Made from seaweed, kelp noodles are low in carbs, calories, and fat. They’re also a great source of calcium. Kelp noodles have a basic bland taste and texture, which makes them great for soaking up and showing off complex flavors. While they’re often featured in Asian dishes, they work well as pasta replacements in other cuisines, too. Soba noodles: In many Japanese dishes, fiber-rich soba noodles are the star player. While they’re similar in texture to traditional long noodles, their nutty flavor makes them a great fit for savory and slightly sweeter dishes. At 24g of carbs per cup, they’re a higher-carb option than veggies, but still lower in carbs than a cup of regular spaghetti which has around 43g of carbs. Black bean pasta: At around 17g per cup, this option is lower in carbs than traditional noodles and full of protein (25g per serving). If you’re looking for a dish that will impress visually as well as in taste, the dark hue of these noodles can make any dish more interesting. Not to be confused with the traditional pasta known as egg noodles, this pasta alternative is made by combining eggs with a dairy product such as cream cheese. The result is a bland, low-carb base that lends itself to any combination of flavors. If you’re buying these noodles in-store, be sure to look for brands that don’t have added flour. If you want something that feels a little more indulgent, you can recreate gnocchi with just two ingredients: egg yolk and shredded mozzarella. In fact, as the Primitive Palate discovered when creating the recipe, while it’s a little more time consuming (you’ll need about a half hour from start to finish) making gnocchi this way is considerably easier than the traditional method. Classic gnocchi has 40g of carbs per cup, but this low-carb swap has just 4g. If you just can’t shake the craving for regular pasta, there are a few steps you can take to make it a healthier choice. Keep an eye on your portion size and cook it al dente (slightly firm rather than soft). This reduces the pasta’s glycemic index so it won’t have the same affect on your blood sugar levels. You can also try making your own pasta at home. Just substitute almond flour for white, bleached flour. Not only does it have fewer carbs (1.6g compared to 75g) but adds the nutritional benefits of healthy fat-rich almonds. Behera SS, Ray RC. Konjac glucomannan, a promising polysaccharide of Amorphophallus konjac K. Koch in health care. International Journal of Biological Macromolecules. 2016;92:942-956. doi:10.1016/j.ijbiomac.2016.07.098.